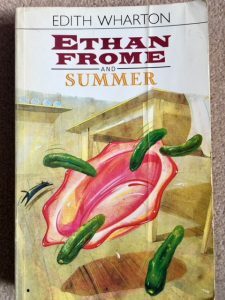 This entry was posted in American Literature and tagged Edith Wharton, Ethan Frome, Oxford University Press by Simon Lavery. Bookmark the permalink. I agree entirely about the cover art! Agreed about the cover too! I have this but have never managed to finish it – I think the bleakness alarmed me when I tried but I’ll have to give it another go because her writing is so good! Karen: it’s not a cheerful read, you’re right. But it’s very short – just 95 pp. – and as you say, superbly written and engrossing, despite the grim material. 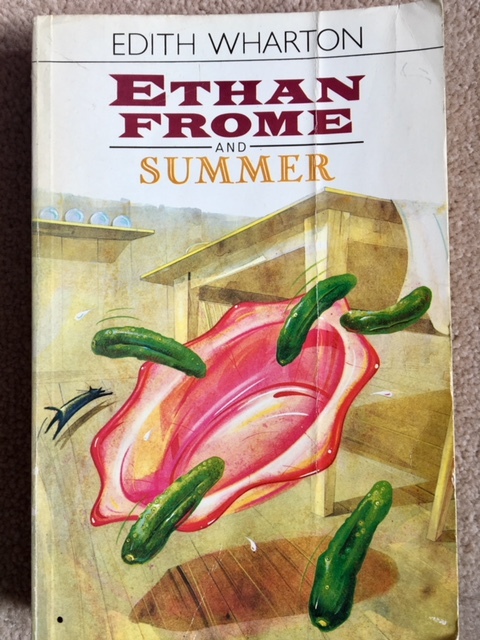 Not even the stupid cat on the cover lightens the mood – in fact he makes the seething emotions in the Frome household worse by breaking the pickle dish. Ethan is interested in one of the gravestones near his house because it bears his name (a forebear, of course), whose wife had the uplifting name of Endurance! The headstone states they lived together ‘in peace’ for 50 years; ‘Then, with a sudden dart of irony, he wondered if, when their turn came, the same epitaph would be written over him and Zeena.’ No chance. Izzy: a good summary. The Jamesian tone is evident in the use of the frame narrator, the perceptive piecer-together of the disparate narratives he elicits from the townsfolk in order to get the full story about Ethan. Hawthorne is there too if nothing else because of the New England setting and the fraught emotional entanglements and dark histories. Spot on about the portrayal of landscape and climate. I wrote this one up at mine too and was rather impressed by it, but by god it’s chilly (in every sense). I’ve read this book a couple of times and it definitely stands up to a second reading – one of the signs of a true classic, I think. Jacqui – welcome back here – we’ve missed you. It’s a little like the importance of setting in Wuthering Heights, isn’t it? The landscape is as important an element in the narrative as the characters and plot. I’d only ever seen the film before, not read the story; I think it was Liam Neeson in one of his better roles, bringing quiet dignity and profound suffering to the part. Mind you, remember little else about it, so it can’t have been that great – though my memory isn’t what it was. I have several Edith Whartons sitting on my shelves but I’ve yet to read anything by her. (When I finally do, I’ll remember to return to your reviews.) I’ve always thought of her books as you describe – high society and privilege abounding, so it’s enlightening to read of these very different novels. I’m not sure when I’ll finally get to reading something by her, and I suspect I may not begin with this one. Any advice on which is the best book to start from, Simon?